Traditional Easter cakes and pastries Until the 21/04/19. A good way to sample the various cakes and pastries of the counties of Girona is at the fairs and markets held there during the Easter period. Depending how you look at it, Easter or Holy Week could be rechristened Sweet Week. Bunyols (fritters), tortells (ring cakes) and mones (Easter cakes) are the main gastronomic traditions of this time of year, which years ago was seen as a time for eating in moderation. In fact, it is thought that the origin of the typical bunyols of Lent is related to worshippers' need to sweeten the days on which they were prohibited from eating meat by the Church. In the absence of meat, cakes and pastries were a welcome treat. So when Ash Wednesday (the first day of Lent) comes round, it's time to head to the cake and pastry shops to stock up on bunyols, and to make some at home as well. 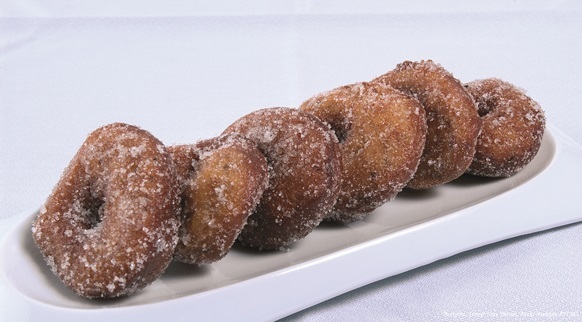 Recipes are handed down from generation to generation for bunyols de vent (literally, "wind" fritters, the hollow variety), bunyols de crema, (cream-filled fritters), brunyols de l'Empordà or other varieties made popular by certain pastry chefs. Whatever the variety, they are always sweet and soft-textured, perfect for snacking on at any time of day. On Palm Sunday it's the turn of the tortell de Rams, a ring-shaped cake stuffed with marzipan and topped with candied fruit, made especially for this day and traditionally given by godparents to their godchildren. The mona de Pasqua (Easter cake), typical of some specific areas, has also become extremely popular. Although it was originally a simple ring-shaped cake or Catalan flatbread with hard-boiled egg, it has since become a highly elaborate cake with popular children's characters and scenes moulded out of chocolate. There are usually some Easter eggs placed on top as well, which play a more prominent role in other cultures. The mona is also typically given by godparents to their godchildren at Easter. A good way to sample the various cakes and pastries of the counties of Girona is at the fairs and markets held there during the Easter period. In Bàscara, for example, the market of tortells takes place, while in Sant Feliu de Guíxols, Darnius, Boadella d'Empordà, Figueres and Garriguella you'll find bunyols to suit all tastes at various artisan fairs and markets.